….what do they have in common? Bear with me. Lynn Barber or ‘Demon Barber’ has made a name as a writer of excoriating profiles of the rich and famous she has interviewed. I listened avidly to her Desert Island Discs appearance on Radio 4 this week and she mentioned that among all her interviewees she had only become friends with a couple of them including Tracey Emin, the British modern artist. It struck me that what both women have in common is brutal honesty. Barber’s account to Kirsty Young on DID was incredibly revealing of her emotional and physical life in a way that I’m sure none of her interviewees had ever been. So to walnut bread, this month’s Fresh from the Oven challenge set by Sarah from Simply Cooked. How honest should you be in writing about your cooking experiences? Do readers want to be inspired by the perfection of cookery and photographic skills? Will they trust you to pass on recipes if you reveal what really went on in your kitchen?! This month I’m in England and cooking in my Mum’s kitchen. I realised just how hard this is as I reached for familiar utensils and ingredients that you take for granted and negotiated with an unfamiliar oven. I got up at 6 am to make the bread as we had a day out at the Cotswold Wildlife Park planned. I used all wholemeal flour as I didn’t want to buy too many ingredients (and I like a strong flavour). The dough was quite wet and it took me a while to knead (I would have reached for the dough hook at home!). Finally the loaves were proved and I put them on an enamel grill pan (no baking sheet) and put in the small fan oven at 180 C (I cook with gas). The loaves looked lovely and I could leave it there and show you the beautiful pictures of their emergence from the oven. Unfortunately they were stuck fast – Superglue would not have done a better job – and I was in a very bad mood as I tried to hack them off with spatula. But mistakes are there to be learned from right? I should have used the big oven so there was not so much direct heat under the loaves. The good news is that the bread was delicious and although I sacrificed the underneath portion of one loaf to the birds there was enough to take to our picnic at the wildlife park. It’s great with blue cheese or a runny Brie de Meaux Recipe below….and I’d be interested to hear your view on honesty. Should I have shown you the blackened pan? First prepare the sponge starter. Dissolve 1/2 tsp yeast in 250 ml lukewarm water in a medium bowl. Let prove until bubbly, about 5 minutes. Dissolve the remaining 1/2 teaspoon yeast with the 250 ml lukewarm water in a large bowl. Let prove for about 5 minutes. Add the sponge starter and mix well. Stir in the honey, oil, whole wheat flour, semolina flour (if using), and salt. Add 160 g of the remaining bread flour gradually to form a stiff dough. Turn out onto a floured surface and knead for ten minutes, adding as much of the reserved flour as needed to keep it from being too sticky. Knead until the dough is smooth and elastic. Grease the bowl and return the dough, turning it to coat it in oil. Cover the bowl and allow the dough to rise until it is doubled in size, about 2 hours. 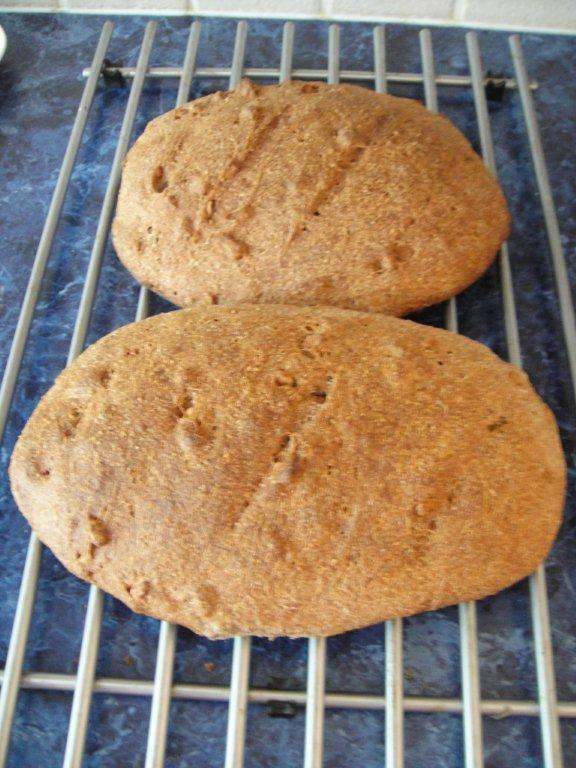 Divide the dough into two pieces and form into loaves. Place on a baking pan and leave them to rise again, about 30 minutes. Bake at 400 F/205 C for 30 to 40 minutes, until the loaves sound hollow when tapped on the bottom. See Simply Cooked if you want the cup measurements. Thanks for a great recipe Sarah – can’t wait to make it in my own home. Last time I baked in my mum’s oven it was a total disaster. The heating resistor was out of order and it took me 3 hours to bake a cake and at the end I threw it away. I think your honesty is endearing and refreshing. 🙂 I find that when I read blogs that always look so perfect, almost too perfect, I get a bit disheartened. We are not all cookbook authors (yet?) and we don’t have assistants or stylists or perfect equipment. I think your loaves look great, and delicious, and I’m sure they were much appreciated by your family. Thanks for posting and for taking part. I also really like your animal photos. I love giraffes–ungainly but beautiful; they really appeal to me. I really enjoyed this post. As with Silvia, I have had similar disasters trying to cook with an oven that is not mine. There are so many options nowadays with the new electric ovens which include the fan, top cooking, bottom cooking a combination of both and presettings… I know it’s supposed to make baking more precise and easy but sometimes I just want an Oven. Do you prefer electric or gas oven? Thanks for all your comments. The bread did actually taste delicious but would win no beauty contests if you looked at its bottom! Silvia, it’s so demoralising to have to throw food away, especially after putting in a lot of effort. Sarah, I’m glad you liked the animal pics too – again I wondered if they were a big mistake! I’m doing the next challenge at my Mother-in-Law’s. Fingers crossed. I like a gas hob and an electric oven and use an oven thermometer with mine in Dubai as all ovens seem to have hot spots. Honesty is always good! One of the fun things about cooking is no recipe will ever turn out the same way twice, how boring it would be if everything came out exactly the same and perfect every time………….surely Martha Stewert is the only person who does that, and isnt she just a tiny bit scary? :) The bread looks great, and it made for an interesting post, am keen to try the recipe actually, I always seem to end up making white bread. Hi! I am a great exponent of ‘non stick foil’ for anything that you may think will stick. I use it for all sorts of things. I am all up for honesty in blogs/cooking. I think it’s good to show we are all human.